For Tom Hadden (51) the morning of 9th November 2017 began like any other day. Tom headed out to work as a bin lorry driver, a job he has been doing for 35 years, when his day took a turn for the worst when he was involved in a serious road traffic collision. Tom and his colleague Nigel were driving up a hill when the accident occurred. After the impact, all Tom remembers is his colleague Nigel getting out of the lorry and calling for help, which arrived in minutes. Nigel also called Tom’s wife who recalls hearing Tom’s screams of pain in the background and she immediately rushed to his side. When the air ambulance Helicopter Emergency Medical Service (HEMS) team arrived on the scene, Tom was in a great deal of pain as he had sustained a multiple crushing injury to his right leg so they worked to help ease this by providing sedation and advanced pain management for extraction. He was also trapped inside the vehicle and would be for a further hour and a half, as the HEMS team worked with the fire brigade to release Tom. Once free from the vehicle, he was then flown by the air ambulance to Craigavon Area Hospital and rushed into surgery. Led by Dr Watson, Tom’s first surgery was lifesaving, relieving pressure from his leg injury over 11 hours. He was then back in for more surgery three days later to close wounds and stabilise his injuries before being moved to the Royal Victoria Hospital. Tom has no recollection of these first few days after the accident. Once at the Royal, Tom underwent further surgery to have an external fixator frame fitted on his leg. He was kept at the Royal for three days before being moved to Musgrave Park Hospital for rehabilitation. Tom is now nine months into his journey of rehabilitation and it is on-going. Six months on from Tom’s accident, the family decided to organise a fundraiser as a gesture of thanks to the charity and coordinated a coffee morning at Eglish Presbyterian Church Hall, with some 700 scones being baked and enjoyed on the day. 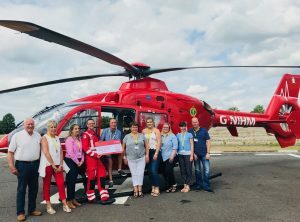 Speaking about the fundraiser Tom said: “We were thrilled to see how the community came together to join us at our coffee morning, recognising the importance of this vital service. We were able to raise £7,000, an amount that will fund the service for more than one day, and we’re indebted to everyone who attended and donated on the day.